To be sure, there are good reasons to oppose a US-supported coup in Venezuela. Many of those likely to be involved would have unsavory reputations, given their ties to the drug trade and their record of human-rights violations. A coup would almost certainly fail, giving an already repressive government a new justification to crack down on its opponents. Another option would be an armed intervention led by Venezuela’s neighbors. They are adversely affected by the flow of refugees, which already numbers 2-4 million and is growing at a rate of 50,000-100,000 per month. If these countries took the lead, they would not have the political baggage of a US-led military operation. But this scenario, too, can be ruled out, owing to the regional bias against military interventions and the fact that Venezuela’s neighbors lack the means to carry one out. Venezuela is roughly twice the size of Iraq, has as many as 100,000 armed citizens, and is riddled with Cuban intelligence officers assisting the regime. Intervention would not be a cakewalk. Critics of intervention favor imposing additional sanctions on top officials. This is warranted, but there is no reason to believe that doing so will be decisive, especially with China providing massive amounts of credit with no strings attached. A second suggestion, to provide meaningful support to refugees, would be expensive; admitting more is not a realistic option for many countries. And such policies address symptoms, not their cause. Venezuela’s future is bleak. The economy has shrunk by half in the last five years; oil production is down by a similar percentage. Infrastructure is crumbling. Inflation is approaching one million percent. Poverty is prevalent in a country that once was among the region’s wealthiest and sits atop the world’s largest oil reserves. Crime is rampant, the health-care system is broken, and hunger is widespread. First, the Responsibility to Protect doctrine, or R2P, which the UN General Assembly unanimously adopted in 2005, in response to the world’s inaction as nearly one million men, women, and children were slaughtered in Rwanda, is essentially dead. China and Russia have stopped supporting it after the Western intervention in Libya in 2011, having come to view R2P as a pretext for regime change. The world has done little but watch or, worse, participate in the destruction of Syria, where more than 500,000 people have lost their lives and a majority of the population has been forced to leave their homes. Second, governments are losing the war against crime, gangs, and cartels. Latin America is home to less than 10% of the world’s population, but accounts for approximately one-third of all murders. Unless this changes, the best people will understandably flee, as will investment. Economic growth will slow or disappear altogether. This is a vicious cycle, not a virtuous one. Related to the last two points is a need to rethink the region’s security. Latin America has largely avoided the geopolitics and wars that have plagued other parts of the world. But this holiday from history has ended. 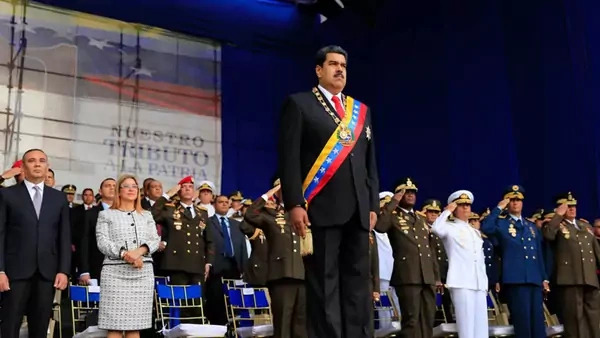 The threats to internal stability are large and growing; and, as Venezuela shows, when internal order breaks down, regional stability is put at risk by refugee flows, gangs, and drug cartels. It is time for the region’s leaders to face up to their fast-deteriorating security environment before it overwhelms them.